Diastasis Recti will often be misdiagnosed as an abdominal hernia with the recommendation of surgery. It is important to understand what is going on with your body so you can make an informed decision. What Does It Feel or Look Like? 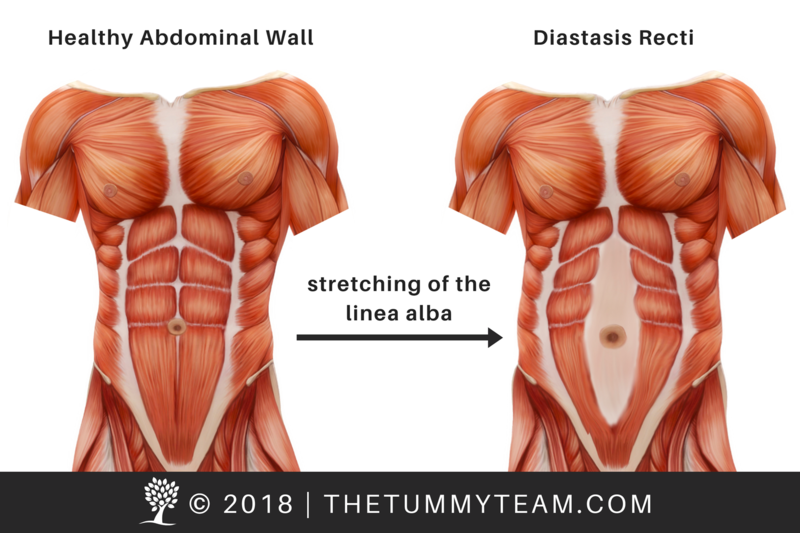 Diastasis Recti will look like a bulging or trench down the midline of your abdominals that worsens with holding your breath and bulging your tummy or straining. It might be tender but not painful. (Learn more about Diastasis Recti and Functional Core Weakness here). A hernia will be smaller, bulging areas where it feels like tissue bulges through a hole and needs to be pushed back in. At times it is painful, sometimes sharp, sometimes causes nausea, can be discolored dark red, purple or grey. If diastasis recti is left untreated, it is possible this could eventually turn into a hernia (tear in connective tissue). Some mild hernias can be managed with core rehab while others need surgical repair. What About an Umbilical Hernia? You were born with a separation in the connective tissue of your abdominal wall (the linea alba) to allow the umbilical cord to attach. Once the cord is cut and tied off, it retracts into the body and eventually adheres to the connective tissue, keeping the belly button ‘tethered’ to the linea alba. 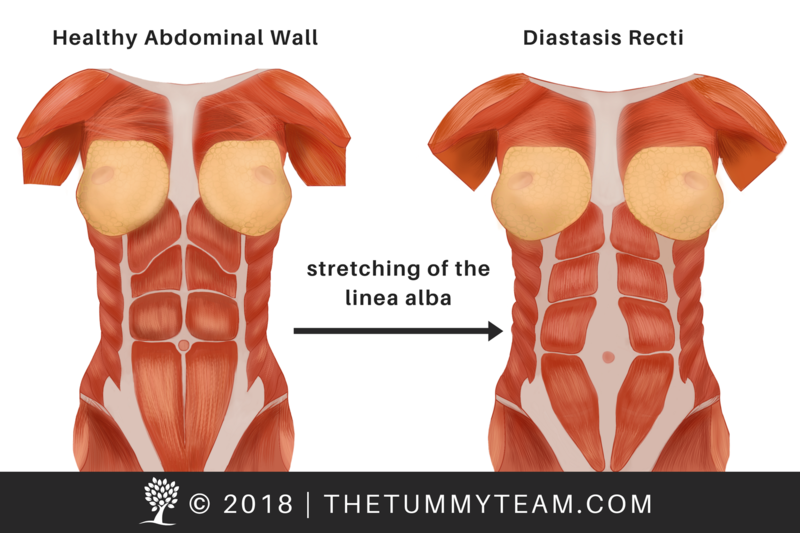 When the linea alba becomes damaged (as is the case with diastasis recti), there are times when that ‘tether’ detaches, presenting with an ‘outie’ belly button, also called a detached belly button. The term ‘hernia’ can refer to anything that pushes out from one area and into another area that it was not in before. 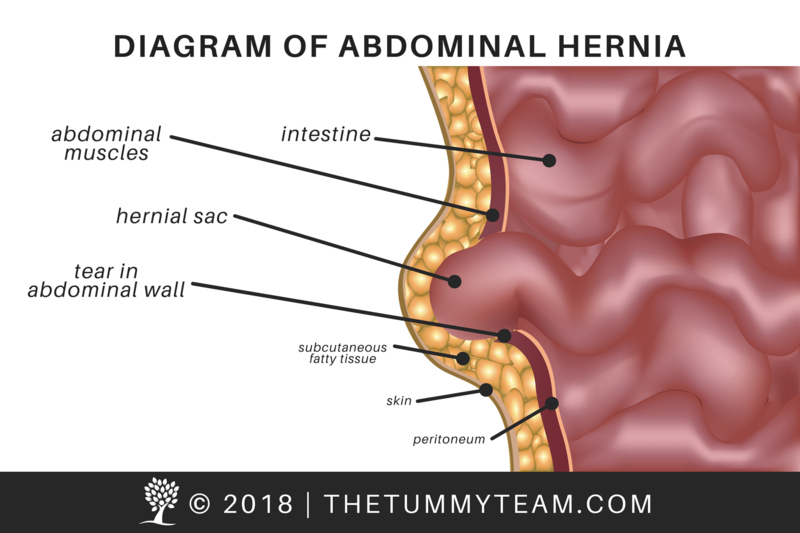 So, an umbilical hernia can refer to a ‘popped belly button,’ or to an actual tear in the connective tissue where internal organs push through. A ‘popped belly button’ can be tender, but should not be painful or discolored. If there is pain associated with an umbilical hernia, it is possible this is a tear and you should seek medical attention. 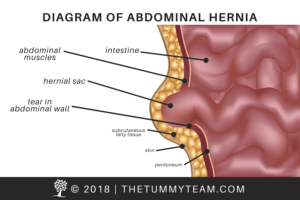 Abdominal hernias will typically appear in areas of weak or damaged connective tissue. When this weakened area of connective tissue tears and pressure against the abdominal wall continues (from poor body mechanics, improper lifting, or poor posture), then portions of the intestinal tract are at risk of bulging through that tear and causing strangulation. This requires urgent medical attention and often surgical repair. Unfortunately, there are a lot of inconsistent views about surgical requirements. In general, if the bulging area is tender or painful, hot to touch, discolored or not along the midline of your abdomen – seek immediate medical attention. However, if the bulging area is down the midline of the abdomen and is not hot, discolored, or painful, then you may actually be suffering from diastasis recti, or simply a detached belly button. Both of these will benefit from our Functional Core Rehabilitation. Sadly, hernia surgeries have an excessive failure rate from post-surgical incision damage. This is most commonly caused by poor body mechanics and pressure against the incision site, which often requires repetitive surgical procedures. When surgery is required but not considered urgent, we can provide pre-surgery rehabilitation (prehab). Rebuilding the muscles and improving your posture and habitual movement patterns will minimize the invasive nature of the procedure and will improve your odds for a successful surgical recovery. In cases of a mild hernia that is not considered an emergency, Functional Core Rehabilitation can strengthen the abdominals, shrink the area of the hernia, and retrain your body to prevent the ongoing pressure that contributed to the weakened tissue in the first place. In most of these cases, clients are able to avoid surgery altogether by eliminating the bulging and herniation risk. With Diastasis Recti, the tissue can be closed without surgery by repositioning the abdominals through abdominal splinting and strengthening the abdominal wall through Functional Core Rehabilitation. If you have already had surgery, or your surgery date is around the corner, we can provide post-surgical rehabilitation to minimize complications, speed up your recovery, and improve body mechanics for long-term success.